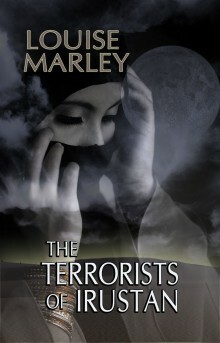 The Terrorists of Irustan was published in 1999, two full years before the events of September 11th. The book was, in fact, inspired by the takeover in Afghanistan by Taliban and the subsequent appalling treatment of women and girls; I was no less moved by the fate of young boys pressed into military service, and also by the effects on men whose mothers and wives and daughters lost their freedom to work and study, and move about unescorted. Beyond the Veil, by Fatima Mernissi; a magnificently written work examining all sides of the issue of women who live a secluded life. Nine Parts of Desire, by Geraldine Brooks; a courageous visit to the hidden world of Islamic women by a Western journalist. What Everyone Should Know about Islam and Muslims, by Suzanne Haneef; a short book by an American Muslim woman explaining her feelings about the Islamic life style. Because the world of Irustan is an analog of a Middle Eastern society, I tried to understand something of the Arab peoples and their culture. Tales, Hazrat Inayat Khan; teaching stories in the Sufi tradition, drawn from parables, fables, legends, and stories of prophets and saints.